We believe that in every area of study, children learn best in context. The City and Country School Mathematics Program is designed to provide that context. Our goal is to encourage children to think mathematically and introduce them to new concepts and skills through exploration, activities, and direct instruction. Students are encouraged to use multiple strategies, allowing them to find a deeper understanding of not just the "what"—but knowing the "why" math is used. As such, students solidify math concepts in the context of a broader social studies or Group Job. Students communicate both orally and in writing to describe their mathematical thinking, and to compare and discuss their observations and approaches to solving problems. Children experience math through the use of manipulative materials, traditional workbook pages, and other teacher-made materials and games. The Lower School program offers many possibilities for contextual learning. When 2s and 3s are learning about comparisons, a teacher at the water table might say, “Your bowl was full. Now it’s empty. Which other bowls are full?” Young children are also taught to pour half of a cup of juice for snack; milk helpers need to recognize that one milk serves two children. In these ways, the City and Country Math Program teaches concepts in context, beginning at the earliest ages. Since C&C's unit blocks are all fractional units or multiples of one another, they present many opportunities for learning mathematical concepts such as numbers, symmetry, patterns, mapping, measurement, sorting, classifying, spatial orientation, multiplication, fractions, and geometry. Through repeated exploration and experimentation with the unit blocks and other materials, the children come to intuit these concepts, then hone their understanding of them. And because children at C&C have ample time to work with the materials, learning becomes an integral part of their daily lives. By the time fractions are formally introduced at age seven, the children are simply being given the language and symbols to illustrate ideas they already understand and have been thinking about since they were two years old. Math in the Middle School continues to value opportunities for children to apply their math skills to real-life settings. 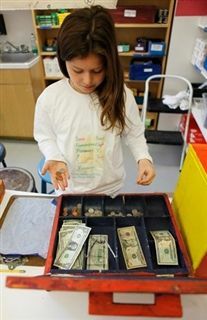 The Jobs Program provides the 8s with opportunities to make change, reinforcing two-and three-digit addition and subtraction skills when working in the Post Office, whereas higher priced supplies in the 9s’ Store, requires children to have their multiplication, division, and money facts at their fingertips. Moving from Middle to Upper School, math problems become more sophisticated and require students to draw on their robust number sense, flexibility when problem-solving, and algebraic thinking. The curriculum’s emphasis on fraction proportional relationships is benefitted by a student’s understanding of proportional relationships with blocks. By the 10s and 11s, the children are exploring geometric relationships and applying mathematical understanding to create models that connect with their social studies—and their understanding of the world around them. For example in the 11s, through their study of properties of polygons, students design tessellations inspired by Islamic architecture. In the 12s, the Pythagorean Theorem is approached conceptually so students understand it as the Ancient Greeks did—the size of squares around a triangle—as well as practically, so students can find the unknown side length by applying algebraic strategies. Upper School students develop the ability to solve linear and exponential equations and an understanding of rational and irrational numbers. By the time they graduate, students have completed the equivalent of Algebra I.